It may not be the most noticeable feature of your appearance, but stretched or elongated earlobes can be source of concern or even embarrassment for some people. Our earlobes are made entirely of cartilage, so the risk for damage is high. Due to the inevitable effects of aging (such as thinning and loosening skin), the earlobes can sag or lose their form over time. It is very common for the earlobes to stretch or elongate from wearing earrings over a prolonged period of time, particularly if they are heavy earrings. It is possible that the earlobe can even split due to these factors. Fortunately, for patients who want to continue to wear earrings and restore the symmetry to their earlobes, an earlobe repair surgery can be performed. Rest assured that this is a simple and quick procedure that can be performed in the office under local anesthesia. In most cases, there is no down time required for earlobe repair. Long earlobes can be reduced in a variety of ways, either as a stand-alone procedure or at the same time as a neck lift or facelift. Reduction techniques involve the removal of excess skin and artistic recontour of a rounded curve of the ear lobe to restore and rejuvenate its appearance. 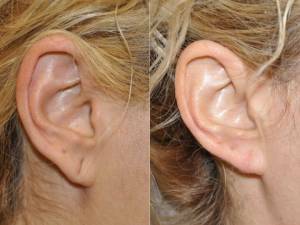 Split earlobes can sometimes be repaired using small flaps to redesign the earlobe. Absorbable sutures are typically used during this procedure and any scarring is well concealed and unnoticeable. Once the ear lobe is repaired or reduced, the ears can be re-pierced after four to six weeks. Patients can expect minor bruising and swelling, and any discomfort can be easily controlled with over-the-counter pain medication. If you want to restore a more youthful form and shape to your earlobes, contact Dr. Talei of Beverly Hills Center for Plastic & Laser Surgery. We offer all types of advanced cosmetic procedures for the ears and other areas of your face.